Due process ensures that the government acts fairly in any proceeding which may result in the loss of life, liberty, or property. 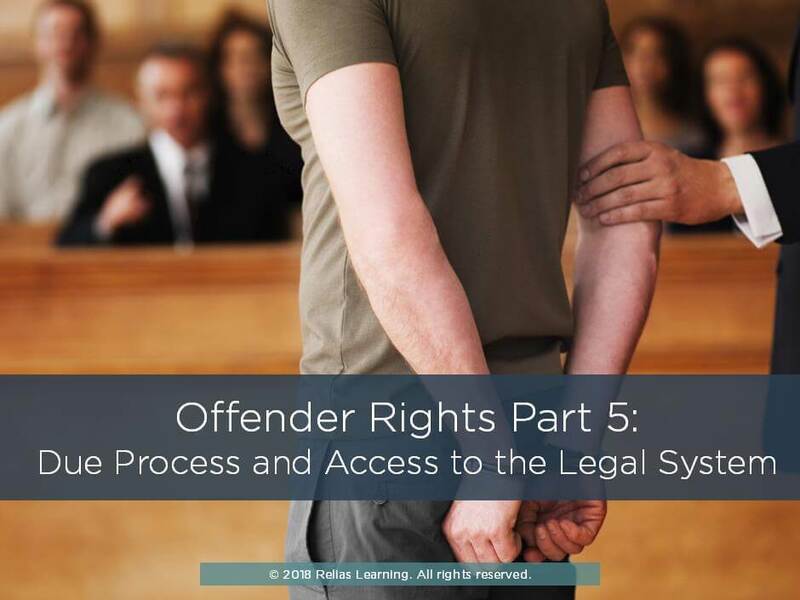 Individuals in correctional facilities are required to follow due process procedural protections in several situations where life, liberty, and property are at stake. This course will provide correctional officers working in adult jails, prisons, and community confinement facilities with an overview of the due process rights of individuals in correctional facilities. Covered topics include facility placement and transfers, conditions of confinement, disciplinary hearings, and access to the courts, legal materials, and legal assistance. Differentiate between when due process is and is not required for individuals in custody in jails and prisons. Identify 4 common reasons that inmates/detainees seek access to the courts. List 4 responsibilities correctional officers may have to ensure detainee/inmates have access to the courts. Define the term "jailhouse lawyer" and identify up to 3 ways in which institutions can restrict jailhouse lawyers' activities. Differentiate between what correctional officers can and cannot do related to privileged communication between offenders and their lawyers. A. What is Due Process? B. Where is it Mentioned in the Constitution?